This blog has been pretty quiet lately, huh? Not being able to blog during the workday really puts a cramp in my flow! I've been feeling the itch lately to get back to writing posts and this one has been in the wings for a while now, so here it is. A short time ago, Enjoy Life Foods kindly sent me complimentary samples of two of their new products. 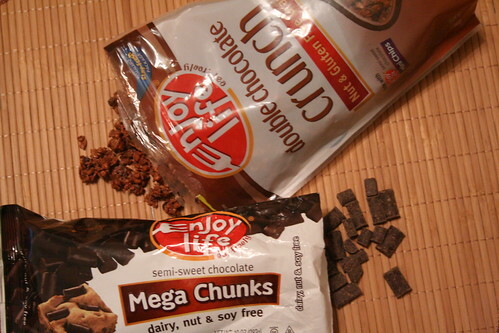 Mega Chunks semi-sweet chocolate chunks, and Double Chocolate Chunk granola. Of course anything that involves chocolate, I am sold. 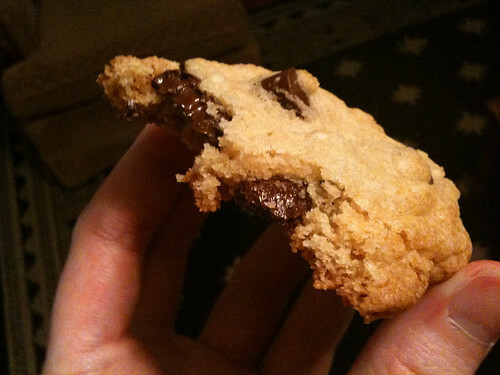 I planned on baking something using the chocolate chunks, but I just keep eating them straight out of the bag! These are so good and I know they'd be awesome in cookies or any baked treat. I actually have been wanting to make chocolate chunk muffins or something cakey like that. I just haven't had the time. The granola is also really good. I wish I had some almond milk to pour over it but again, I just keep grabbing handfuls of the stuff to munch on. I definitely recommend both of these products, especially if you are in the middle of a major chocolate craving. Which might be my daily life.. but whatever. Otherwise, life is good. Haven't converted the boy to a GF/DF diet yet but maybe someday. I'm full into the swing of summer and looking forward to lots of fun events this year including a week on the Cape. I can't wait for that! I hope you all are well! !